The Best in Britain – almost! The Frome Independent has been named as a runner-up in the Observer Food awards for best market in Britain. The award was chosen by Observer Food magazine readers by public vote and announced on Sunday 18th October. Tabitha Clayson from The Frome Independent said, “We are really thrilled to be placed as runners-up in the ‘Best Market’ category of the Observer Food 2015 Awards. “Not only does it put us on a fantastic national platform and in the company of many well respected and long standing markets, but as the ‘Best Market’ category was one voted for by the public, it’s a great endorsement from the very people who come and shop and socialise with us. “We’d like to thank all those who voted for the Frome Independent and most importantly the incredible food stalls and producers that come to our market every month. “We are incredibly lucky that we are based in a beautiful part of the UK where some amazing food is produced, and we have the pick of the bunch of an established group of farmers and artisan food producers right here on our doorstep. November’s market was a celebration of women’s work. 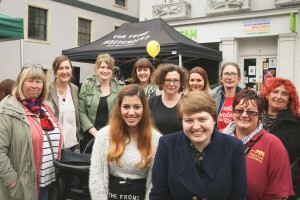 At an average Frome Independent market more than 60% of the stallholders are women and many more businesses are family affairs raising the gender ratio of the market even higher. On top of that, The Frome Independent has been conceived of, branded, marketed, produced, managed, risk assessed, stewarded and photographed by a team of women. Sunday 6th December will be the last market of the year and the place to hunt down amazing food and unique gifts for Christmas. Follow The Frome Independent on Facebook, Instagram and Twitter (@morethanamarket) to keep up with all their news and events.